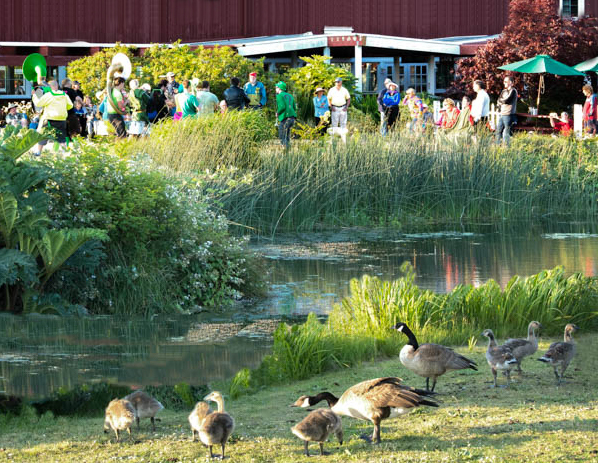 It wasn’t just Whidbey’s resident Canada geese “honking” at Greenbank Farm on Monday, June 22. 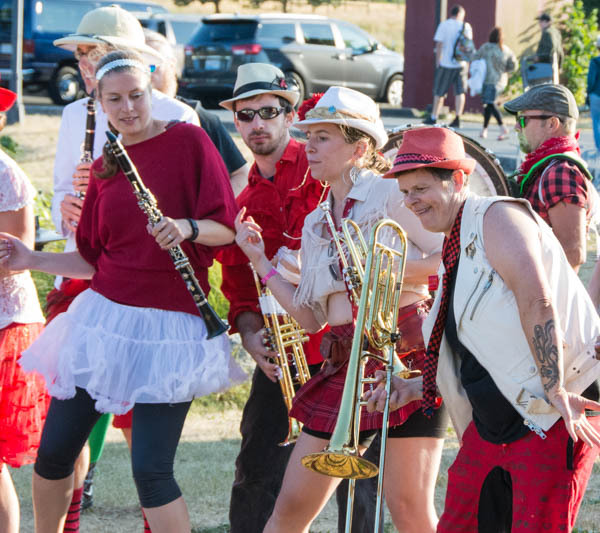 Madisun Clark-Stern, Events coordinator at Greenbank Farm, enjoys the D20 Brass Band from Seattle. .
Nine brass bands from around the U.S., plus one from Perth, Australia, gathered on that afternoon to play at two stages at Greenbank Farm during the “HONK! 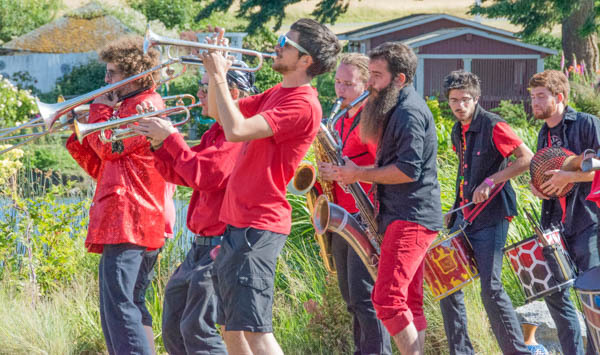 Fest West Coast Tour: International Brass Band Madness!” global music exchange and picnic that followed an entire weekend of Seattle’s HONK! Fest West. 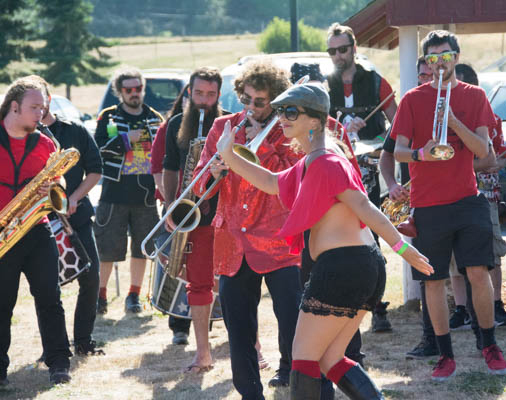 sambAmore band from Arcata, CA included a retinue of dancers. 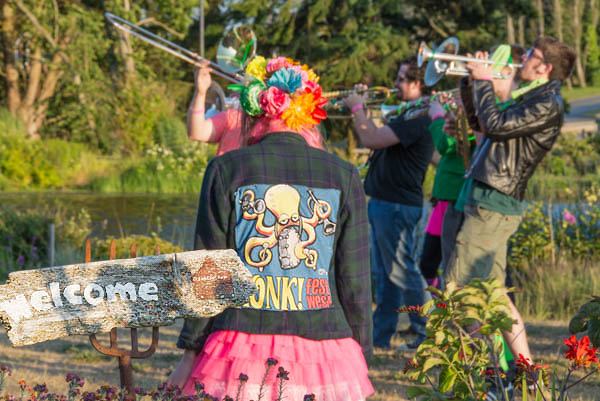 Even Greenbank Farms’ Canada Geese enjoy HONK! as the D20 Brass Band plays on. Bands included Junkadelic Brass Band from Perth, the New Creations Brass Band from New Orleans, Environmental Encroachment from Chicago and the Extraordinary Rendition Band from Providence, R.I. Several bands ventured over from Seattle, while areas of California, Texas and Minnesota were also represented. 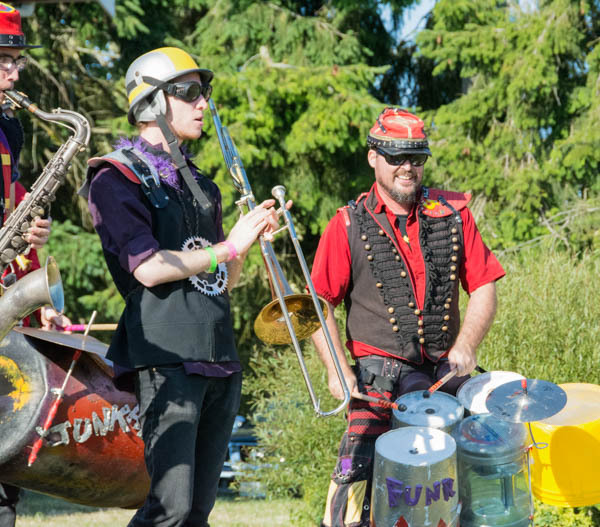 Although all the ensembles are considered “brass bands” and were only a small representation of the number of bands who performed in Seattle, the styles of music they played varied from Dixieland to blues to jazz and samba, and no two were alike. Perth’s “Junkadelic” even included an electric guitarist and a rap singer. 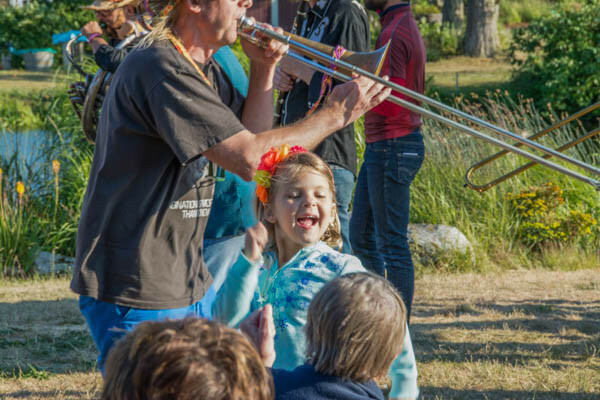 The exuberance of the Brass Messengers, from Minneapolis, encouraged this little girl to join in the fun. 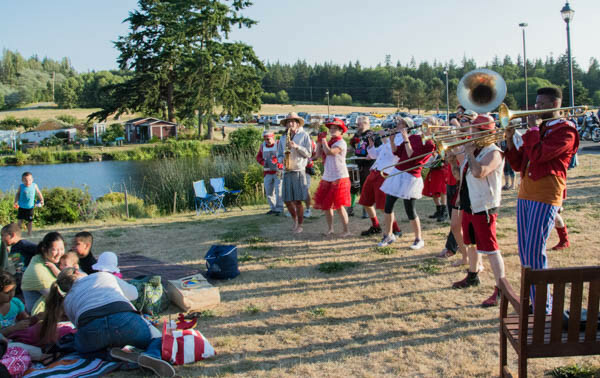 Greenbank Farm partnered with Click Music and sponsor Whidbey SeaTac Shuttle, which provided transportation for band members, to host this Brass Band Picnic, bringing the bands to the heart of Whidbey Island. 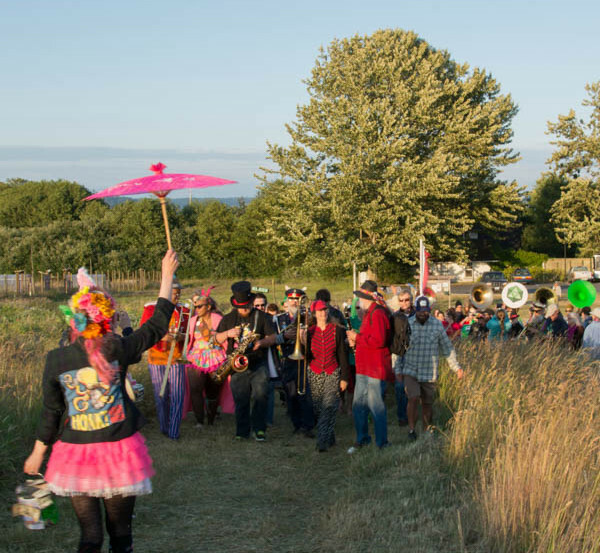 Presenting a global music exchange of community street band culture for the first time on Whidbey Island, the musical groups drew several hundred picnicking music fans to the farm for this first free, family-friendly music explosion. 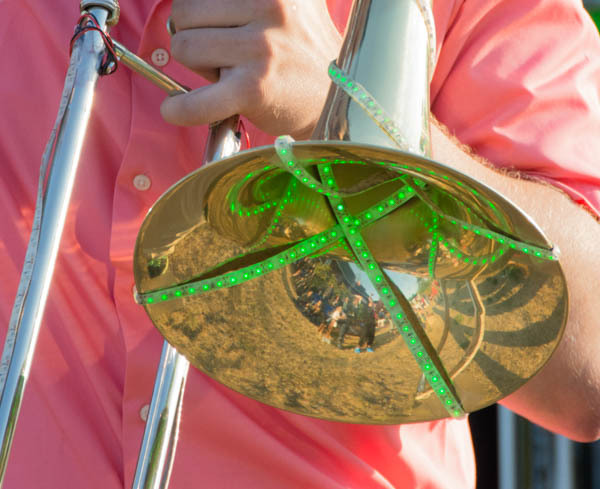 A trombonist with D20 Brass Band utilizes special effects to enhance the crowd’s experience. 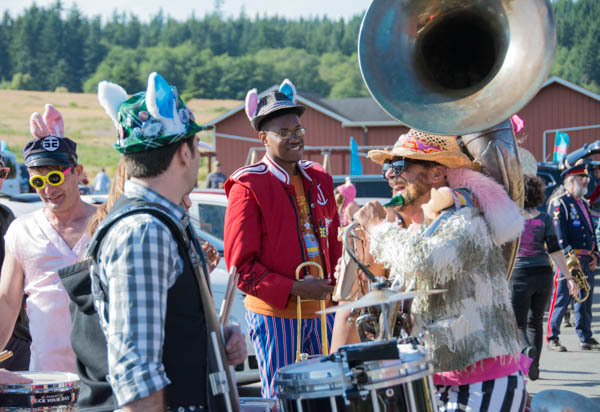 Following four hours of non-stop performances, all band members merged together near the Tractor Barn, forming one huge processional; then they meandered together, as the sun set—up the trails and into the hills to the ridge top viewpoint, all the while improvising on old blues favorites. It was surely a different experience from their weekend parades in Seattle. 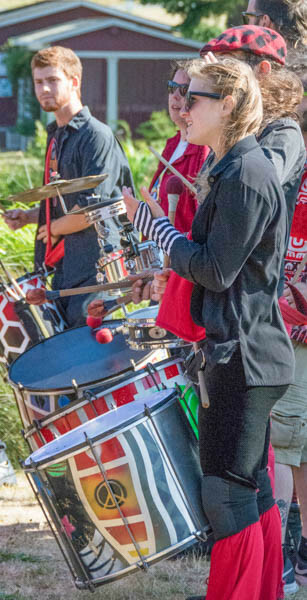 Clark-Stern leads the way into the hills as the bands close out the day’s festivities. 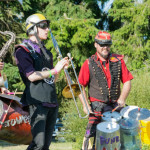 Click on HONKfestwest.com to learn more about HONK! Fest West events. 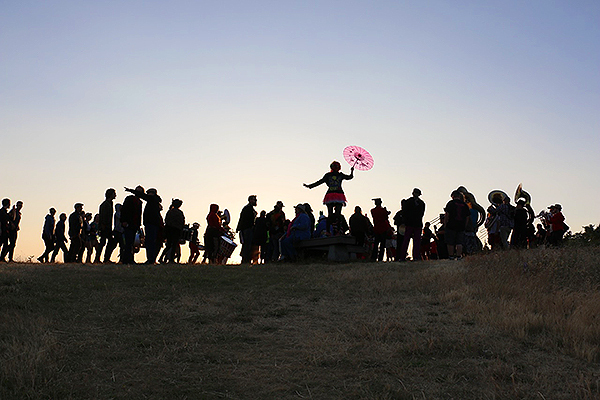 3 cheers to Judy Feldman for the stunning last photo, the crowd silhouetted with the pink umbrella in the setting sunlight. 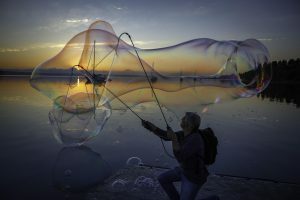 Fabulous shot!!! !